You are currently browsing the category archive for the ‘Extremely Loud and Incredibly Close’ category. My writeups, if you haven’t already gathered, rank the nominees in reverse order of how I like them. But here, as John mentioned, we’re ranking the best picture movies as if we were Oscar voters. 1. The Artist. Yeah, picking this film is almost cliche at this point in awards season. But that’s only because it is the best film of this lot by leaps and bounds. The others really aren’t in the ballpark. At this point I’ve waxed rhapsodic about so many aspects of the movie that really, all that’s left to say is that all these wonderful aspects of the film: writing, directing, acting, cinematography, just everything all combines together into one really great movie. 2. Midnight in Paris. It is a sign of how poor an Oscar year it is that when I saw the film over the summer, I was wavering over whether I thought I’d give it Oscar consideration and now it is my second-favorite film of those nominated. It is light, fun, and not particularly deep. 3. The Help. It is a decent movie, and pretty much nothing like what people are projecting onto it. Race issues get people riled up, and I don’t know if that’s good or bad, but if you can look past all that, you’ve got a fine movie. Maybe a little bit bloated and unfocused at times, but it is funny, warm, and entertaining. Not one of the nine best movies of the year, but certainly no outrage. 4. The Descendants. And here’s the part of the list with films that make me go, “Eh.” I currently have this film as the 36th best movie of the year. There are certainly plenty of good things about the movie, like George Clooney and Judy Greer and Matthew Lillard and Shailene Woodley constantly being in a bikini. Each of us has voiced our problems with the plot, chiefly the underdeveloped plotline surrounding the land deal. 5. Moneyball. As I’ve mentioned, great job figuring out how to turn the book into a movie, but they didn’t get quite all the way there. Every single supporting character seemed underdeveloped and underutilized to me. But hey, it is hard to be angry about a best picture-nominated film about the economics of baseball. 6. Everything Loud and Incredibly Close. Another one of those issue movies where people make all sorts of outlandish claims about the film trying to “solve” some really huge issue and obviously failing to do so. It is insane, to me, that anyone could think this film was about healing the wounds from 9/11. Sure, clearly, the events form the backdrop here, but the movie is much smaller than that. It is about a kid who lost his dad, isn’t particularly close to his mom, and is trying to figure out his world. 7. War Horse. Not as bad as some people would have you believe, but hardly a great movie. My biggest problem was that it was hard to get attached to any character, so while obviously it was sad when they died and happy when they lived, it wasn’t that sad or happy. 8. Hugo. Just a bad movie and and a horrible movie-watching experience. Sure, it is pretty and it is great that it references the birth of cinema. But I dunno, I prefer my movies to have an interesting story and not be boring. 9. The Tree of Life. Speaking of boring movies that don’t have a story! Look, I understand if you want to make the argument that this film is high art. I won’t even disagree. But as a movie, it is horrendous. One of the items on the film’s imdb trivia page states that in an Italian theater, two reels of the film were switched and nobody realized the mistake for an entire week. If your film can be shown out of order for an entire week, there is something seriously, fatally, tragically wrong with it. I’m not saying it is the worst movie I’ve ever seen in my life, but I’m also not saying I’ve ruled it out. Unlike other categories where voters pick one nominee, in Best Picture they rank them 1-9. Therefore my pick the winners post will follow the same format. 1. 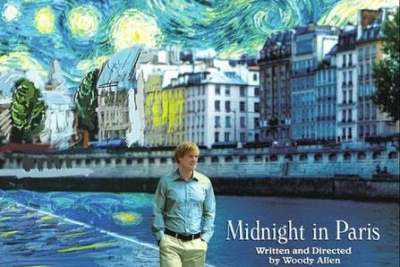 Midnight in Paris. In a season filled with nostalgic pursuits, this is the only one that seriously worked for me. It’s just an absolute delight and I had so much fun watching it. It has an enjoyable, original story and fills it with interesting characters. They’re most characters you’re already familiar with, but the film’s takes on them and their interactions are a good time. It’s all just a whimsical fantasyland. And its simple if elegant message about the nature of the past and nostalgia hit home for me. 2. The Tree of Life. Ambitious, beautiful, moving, grand. I love its structure of wispy memories paired with gorgeous music. It’s a bizarre creature that washed over me and I loved it. Plus it’s the only nominee with dinosaurs. 3. The Help. Probably the film here that surprised me the most. It’s very entertaining and I found it really effectively evoked a time and place (which always helps get me through the times the schmaltz gets dialed up to eye-rolling level). Great performances as well. 4. The Descendants. I didn’t love it, but it has some undeniable beautiful, heartfelt sentiments and moments. Even as the stories never really came together in a satisfying manner – this is the only movie where I wanted to hear more about a perpetual trust! – a sense of sadness settled within me. I have a lot of goodwill for this film though I wanted it to be more. 5. The Artist. I just never took to this like everyone else seems to have. It’s fine enough, but there’s just not enough there. It gets some flak for being slight in that it’s thematically light, but its bigger sin is being narratively slight. Not enough happens and the thrill of the silent, black and white aesthetic wears off. 6. Moneyball. I can’t deny its technical proficiencies, but even after a second viewing it still feels like maybe a quarter of a story. I just think the filmmakers concentrated on parts of the Moneyball story that I find less interesting. 7. Extremely Loud & Incredibly Close. I never expected to like this and hell if it isn’t… adequate. It can be contrived and exasperating, but its unique perspective and occasional moments of earned emotion pull it through. 8. Hugo. It just didn’t do much for me. In fact, it mostly just bored me. I kept waiting for the magic to begin… then it ended. I guess my hard heart is a tough nut to crack. 9. War Horse. I’m going to ruin this movie for you: it’s just a damn horse. So when people do a bunch of stupid stuff for the main character they’re doing stupid stuff for a horse. And judging from the music you’d think the horse scores a winning touchdown every 20 minutes or so. Still, it has a few good WWI scenes. My list of Supporting Actor couldashouldas is even longer than what I had for Supporting Actress– I could easily fill out a full batch of nominees for the category: Ben Kingsley for Hugo, Andy Serkis for Rise of the Planet of the Apes, Corey Stoll for Midnight in Paris, Patton Oswalt in Young Adult and Uggie in The Artist. Sure, the last one was a little bit of a stretch, but you never know. I’ll start with everyone’s favorite nominee that I don’t really understand. Christopher Plummer plays a gay, dying old man. If he has been a Holocaust survivor then that’d have checked off all of the Academy’s weak spots. It helps his case that he’s in the same movie as a flaccid romance and a way-too-twee conceit. But I found his performance underwhelming. Max Von Sydow falls in the same category as a “career achievement” nominee for me, though I appreciated his work as a mute in ELIC. (Yet another Academy weak spot — physical disability). Playing off the unbearable precociousness of Thomas Horn’s Oskar, von Sydow’s expressive face was a nice respite, but he was never able to transcend the strained premise. Kenneth Branagh? Sure, whatever. Get him back to doing something that befits a man of his pedigree. He was as stuck in Marilyn as Olivier was inThe Prince and the Showgirl. Jonah Hill’s nomination is the one that makes me angriest, mostly because I should be thrilled that a young, comedic actor is getting recognized. But Hill didn’t DO anything in Moneyball except wear glasses and play against “type.” There are many things about Moneyball that make me think I saw a different movie than the one others did (especially the folks at The Atlantic) — Jonah Hill’s nomination is a the top of this list. Everyone should go see Warrior. I’ve been preaching the gospel far and wide on this one. Nick Nolte is one of many reasons why. His sons are MMA fighters — strong, brutal and merciless — but they are feeble when it comes to interacting with Nolte. It’s a multi-layered performance that can only improve with repeated watchings. Give the award to Nolte!! Supporting Actor elicits the opposite response from me than Supporting Actress. I have no pretty much no interest in three of the nods, a fourth is okay, and one is miles above the rest. I wish I had the Supporting Actress problem of having to parse great acting from the great written character for these uninspiring picks. I generally like Jonah Hill but I don’t see what’s so special about this performance. I can see some improvement in his work – he’s no longer half-shouting his lines – but I wouldn’t rank it among the year’s best. Branagh didn’t entrance me, though he’s not helped by a total snoozer of a film, while von Sydow is meh. By the time I saw Extremely Loud and Incredibly Close I knew von Sydow had scored an Oscar nomination. I kept waiting for some scene that would show how he earned that nod… and then nothing materialized. Nolte does kind of hit the same notes again and again in Warrior. Sad, angry, or thrilled the dialogue all gets croaked out similarly. But given his years of boozing you could say he’s been preparing for this role for years! He’s certainly memorable, though it is a little tough since Tom Hardy and Joel Edgerton both stood out to me more in the film. Still, I think there would be a temptation to play up some of the character’s emotional moments – create an Oscar Scene, even – but Nolte keeps it realistic. Not that I needed to eliminate the others to reach this conclusion, but Christopher Plummer is the obvious winner. There’s a lot of complexity to a the role despite its fairly limited profile. There’s the regret for all the years he suppressed his true self, the timidity of launching into a new life at an advanced age, the joy of new love, the support of a father for a son, and the contemplation of impending death. Plummer is marvelous in all these aspects. Whenever he isn’t on screen, Beginners seriously drags. Plummer is so mesmerizing and his subplot so interesting that the primary plot thread pales in comparison. I would love to see a whole film built around this character. This category is so lackluster I can’t even name many other actors I wish were here instead. I wasn’t as taken by Drive‘s Albert Brooks as others, but his play against type as a psychopath made for a great story. Ditto for Patton Oswalt in Young Adult, whose unrealized nomination would have been a nice recognition for a terrific but underexposed film. Otherwise, some of the actors from the sprawling casts of Tinker Tailor Soldier Spy orMidnight in Paris would have been nice: Benedict Cumberbatch, Tom Hardy, Corey Stoll, or Tom Hiddleston. What an odd collection of nominees. The next time someone tries to convince you there’s such a thing as an Oscar performance, point them to this category. You can’t say the nominees came from “Oscar movies”, because two of the films weren’t nominated for anything else. The nominees aren’t all old or young or handsome or ugly or rookies or veterans or dramatic or comedic. And you can’t say any had an Oscar scene. Heck, it’d be easier to argue none of them had a traditional Oscar scene. Indeed, about the only thing the performances have in common is that they aren’t particularly near my top picks of the year. I remain baffled as to how Jonah Hill secured a nomination for such a blank character. I’m guessing Brad Pitt just went around telling people to vote for Hill. Which, to be honest, is probably the most effective campaign strategy for anything that I’ve ever heard. I love the concept of Nick Nolte getting a nod for portraying a grilled old dad/trainer in a fighting movie that was one of the best of the year. Kudos to the PR team for turning that in an Oscar nomination. What complicates the pitch is that I’m not sure Nolte was required to show any depth or range. There has to be someone somewhere who can explain to me what’s so great about Christopher Plummer in Beginners. I swear that I went in with an open mind and additionally have read multiple people’s takes on the role. But, I dunno. Nothing in particular stands out for me there. Does Max von Sydow get in if this wasn’t the year where a silent picture rampaged through the awards circuit? That’s a tough call. I’d argue The Artist certainly made people more receptive to a character that doesn’t speak. Though that film is also an example of how people in a movie can be so expressive even without any dialogue. As opposed to Extremely Loud and Incredibly Close. I seem to to recall the book giving the character more backstory, maybe that is what’s missing here. So by process of elimination, that leaves…Kenneth Branagh? Fine, whatever. I think people are getting too caught up in the storyline about how Branagh is like Olivier, and so it is cute the former is playing the latter in the film. Or how odd it is for this all to be happening in a relatively light movie. But I think Branagh was solid. More than anything, his character served as a way to explain to the audience what was going on with the movie in a movie and what should be going. Branagh rises to the occasion and turns the character into one worth remembering.